Hi lovelies, I'm back again with another skincare related post, but what can I say? I'm a skincare junkie so I love to share with you guys my thoughts on whatever I've been trying out. In this post, I'll be sharing my thoughts on the infamous DHC Deep Cleansing Oil. Disclaimer: this product was gifted to me for reviewing purposes. All opinions are 100% my own. Whenever I hear the words 'cleansing oil', this is the product which immediately comes to mind. To me, cleansing oils seem to be a more recent skincare phenomenon, although I know they existed previously, but they've become a lot more popular in the blogger and social media sphere in recent months. I had never tried a cleansing oil until recently, as you'll know from my previous post trying some Caudalie cleansing products. 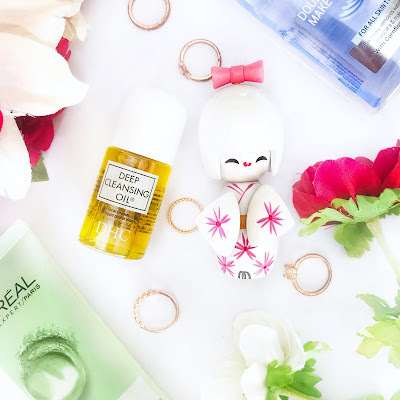 I never thought cleansing oils would suit my super oily skin, but I've really been enjoying using them, as they are so much more relaxing and easy to use than the likes of micellar water. There's something so calming about massaging a nice cleansing oil onto your face and removing all the makeup and grime from the day. Another bonus is that you can wash it off and apply your cleanser straight after, meaning your cleansing routine is so much quicker than before. DHC is a Japanese skincare brand that encompasses lots of amazing products to improve your everyday skincare routine. The brand highlights the importance of double-cleansing, which is something I always ensure to do if I've been wearing makeup that day. Double-cleansing means taking your makeup off (e.g. using this Cleansing Oil) and then cleansing your face again with your normal cleanser. This ensures all the makeup and grime on your face is completely removed. A bottle of DHC's Cleansing Oil is sold every 10 seconds worldwide - how crazy is that?! This just shows how amazing the product is and how it has become a well-loved staple in so many people's skincare regimes. I was super grateful to be contacted by a PR team to receive the adorable mini version of this product, and even received this gorgeous little gift alongside. I literally used this on the same day I received it, as I was so excited to finally try it out after hearing all the rave reviews. I shook a good few drops of this onto my hands, warmed it up into my palms and massaged it into my dry, makeup-filled face. The product feels super nourishing as soon as you smooth it in, and has a very light scent, so I'd imagine it to be perfect for sensitive skin, as it didn't seem to cause any issues with mine! All of the core DHC products are fragrance, colourant and paraben-free, which is obviously amazing for sensitive skin. I like to blend my cleansing oils in for about 5 minutes, especially if I've had heavier makeup on, to ensure it's all completely off. After applying, I rinsed the product off and my skin instantly felt so soft and smooth, I loved it! My skin always feels super clean, refreshed and extremely soft after using this, ready for my second cleanse. Once my full cleansing routine is completed, I can clearly see there isn't a trace of makeup on my skin, and it looks and feels lovely and clean. This little miniature version is perfect for travelling and I'm super excited to bring this on holiday with me. I think cleansing oils in general are perfect for travelling, as you don't have to bring lots of makeup wipes or cotton pads with you unlike other products. You simply bring your trusty cleansing oil and you can easily take your makeup off, wherever you are. So there we have it, my thoughts on this glorious DHC Deep Cleansing Oil. In my opinion, it definitely lives up to the continuous hype it receives, and I think it's a product that everyone should try, at least once. If you're looking to try a cleansing oil, definitely go for this one, as I'm sure you'll love it as much as I do! Have you tried this Cleansing Oil? What other cleansing oils have you tried? Let me know in the comments! As always, thanks for reading. This sounds like a really nice product to use. I like that it has a light scent, I really dislike cleansers that are too harsh smelling! Love this post and would love to try out this product sometime as I've always wanted to try a cleansing oil! I didn't know that cleansing oils have been a thing until recently. Now I am learning from you XD. Pretty cool that DHC is all about improving your skincare game. The miniature version looks so cute. Glad it performed per expectations. I like that it doesn't break the bank either in terms of cost. I was really scared to use cleansing oil as I have oily/combination skin but I introduced oil into my skincare routine and use it when my skin needs a bit of TLC. I haven't used a cleansing oil for a good few years now, but this might be the next item I have to try! Japanese skincare brands never disappoint! I've never tried a cleansing oil before, but the travel packs would be nice to keep in your purse. This sounds like a great cleanser! I need to give a try to this one! I had never heard of the brand before. Not sure I have ever used a cleansing oil either. sounds like a great one! it's always satisfying when a product is worth the hype! This is such a good product. I've really been liking cleansing oils recently. My favourite one is the new Caudalie one. It sounds lovely. I use a cream cleanser at the moment, but I've been considering switching to an oil. I've not heard of this brand before (clearly I've been living under a rock) but it sounds wonderful. I use a creamy face wash at the moment, without a separate cleanser, but this travel size sample would be a great way of trying something new as I've never used a face oil before either!